Syria's Minorities: Caught Between Sword Of ISIS And Wrath of Assad : Parallels Many of Syria's minorities have tried to lie low and avoid direct involvement in the country's civil war. But they frequently get caught in the crossfire, with no protector to turn to. 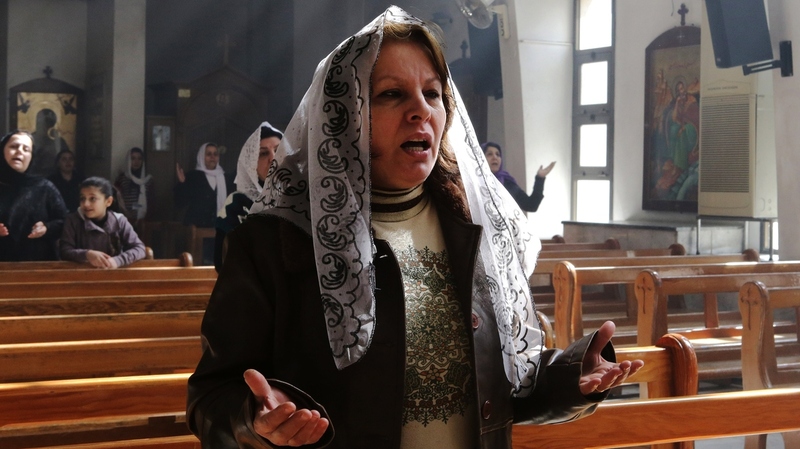 Assyrian Christians, who fled their homes because of attacks by the Islamic State, pray at a church on the outskirts of Damascus on March 1. Many minorities in Syria have tried to remain neutral in the conflict, but they often get caught up in the crossfire or are targeted by extremists. It's a life-and-death dilemma for these small communities that have come to feel ever more vulnerable. And as Syria has fractured during four years of fighting, religion has often been the dividing line. The country has been dominated by Assad's Alawite community, an offshoot of Shiite Islam that makes up about 10 percent of the population. Sunni Arabs are the majority at 65 percent, while the Kurds, also Sunnis, are 15 percent, according to Syria expert Fabrice Balanche, who directs the French research center GREMMO. The remaining minorities are less than 10 percent of the population: The Christians include the Assyrians, who still speak the ancient Aramaic language of Jesus; there are the Druze, who borrow elements of Judaism, Christianity and Islam; and the Ismailis, an offshoot of Shiite Islam, and the Shiite Muslims themselves. With the growing threats, one choice for vulnerable minorities would be to look to the government for protection. But in the wake of several ISIS massacres, minority communities say the regime is either too weak to defend them, or may be allowing attacks to provoke fear and coerce them into joining pro-government militias. 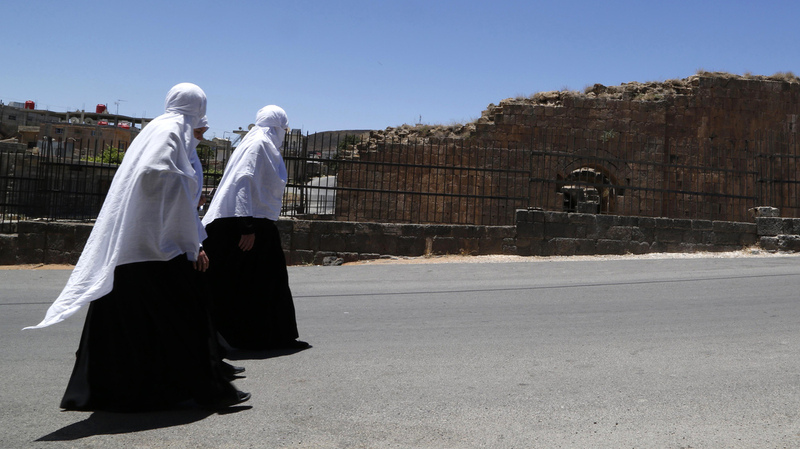 Druze women walk beside Roman ruins in Shahba, in southwest Syria, last June. The Druze are one of several minority communities that have generally tried to avoid direct involvement in Syria's civil war. "They knocked on my neighbor's door, just 10 steps away. Of course they killed him and his wife," he told NPR via Skype, withholding his family name for fear of his safety. Ali was terrified, waiting with his father and sister from 11:30 p.m. until the next morning when ISIS withdrew. He says that by the time the paramilitary National Defense Forces arrived from the neighboring village of Saboura, it was too late: "Whoever was kidnapped was kidnapped and who was killed was killed." Not only was the NDF late, it looted the homes of the victims, according to Ali. In addition, he says thousands of pro-regime militiamen and Hezbollah fighters were stationed in Saboura, just a few miles away, yet they did not come during the killings. Ali fled to Salamiyeh, the heart of Syria's Ismaili community, where fear of another attack has been matched by anger at the government's lack of action. As a minority community that initially took to the streets against Assad in the early stages of the war, the Ismailis played a role in the Syrian uprising. But many now suspect that they are being taught a lesson. "Everyone believes the regime wants to sell us out, maybe to mobilize more forces and deploy sectarian militias, since we refuse their presence until now. But for us, these militias don't differ much from ISIS. They've committed the same crimes in other villages," Ali says, adding: "If the regime wanted to protect us, they would have stopped the massacre in the first place." Should Minorities Take Arms From Assad? The Ismailis and other minorities face a tough choice — to mobilize their communities to join the regime's paramilitaries, or to risk annihilation by extremists. Many want to form autonomous militias, separate from any link to the regime. But they would need weapons. In recent weeks, Ismaili and Druze delegations traveled to Damascus asking for just that. "Bashar told them, 'You have 24,000 draft dodgers in Salamiyeh. Let them join,' " says Maher, a Salamiyeh native, whose uncle was on the Ismaili delegation. He withheld his family name for his safety. A Druze delegation from the Sweida province was also met with an icy reception. Rayan al-Jabal, a journalist based in Sweida, says the regime considers them unpatriotic: "They don't want to help the army, but here they are, coming to them for weapons." Druze are fearful of hard-line Islamists, explains Al-Jabal, but "if we take weapons from the regime, this will put us in confrontation with our Sunni neighbors." The regime no longer has the means to defend secondary cities like Idlib, let alone areas that are not considered strategically important, says Balanche, the analyst. Meanwhile, the disproportionate army and paramilitary casualties suffered by the Alawite community have only made minority demands for special protection more contentious. Balanche says the regime cannot accept arming autonomous militias; should minorities refuse army duty, they must be under the central command of the NDF. While some Ismailis and Druze have enlisted in government paramilitaries over the past two years, most refuse. In general, they do not want to be deployed to distant fronts that are not immediate threats to their community. Yet they are also wary of being deployed closer to home where they could find themselves fighting in neighboring Sunni communities, creating bad blood that could outlast the war. Karim Bitar, a Middle East analyst at Paris think tank IRIS, calls this wartime predicament "the tragic dilemma" of minorities. "Politically, morally and even strategically, there are no good options, mainly because the short-term interests of minorities might be at odds with long-term interests," Bitar says. "Minorities are often used as a shield by authoritarian regimes, who try to portray themselves as protectors and as a bulwark against radical Islam." In turn, "minorities risk being perceived as a fifth column against the aspirations of the oppressed majority." One Assyrian Christian man, who in February escaped an ISIS attack against his village in northeastern Syria, put it this way: "The regime wants to be seen in the eyes of the world as the protector of the minorities. But they are spectators."